This afternoon I stopped by the print shop to do a foil-stamp press check for a client's business card. Even though press checking seems tedious at times, I love it...especially when the printers take the time to show me the equipment. When I first got into graphic design, I figured, printing is printing. You design something, then you send a file to the printer to print it. Though it can be that simple with some full-color digital and offset printers, the reality is, printing is an art. It requires careful craftsmanship and a wealth of experience. Lucky for me, our local printers are happy to share their knowledge with me. I never leave without learning something new. Below, you can see the custom metal plate. The light-colored areas near the corners are the lemon slices. The "ribbon" of foil was pushed aside so I could see the plate, but normally these yellow strips would be directly over the lemon slices so the foil can be stamped onto the paper. We'll be sure to post photos of Define Bottle's branding when it's back from the printer, so stay tuned! So today I'm giving you a super secret sneak peek! What are they? 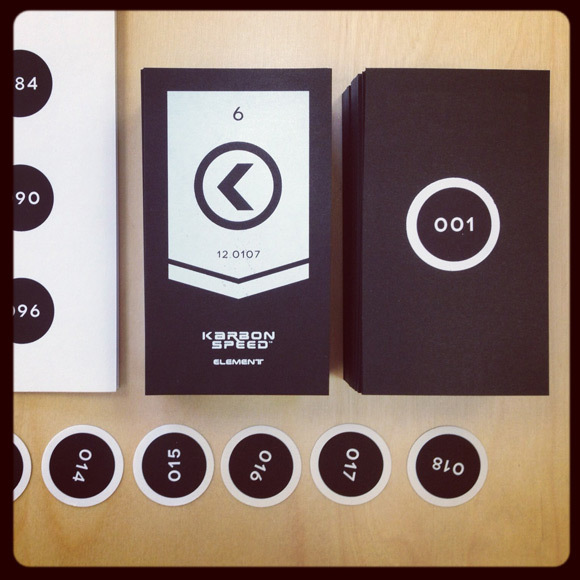 White-foil-stamped, individually-numbered cards on Epic Black stock. No two are alike. What are they FOR? Find out Tuesday on www.karbonspeed.com.